Water quality is a term used to describe the chemical, physical, aesthetic and biological characteristics of water, usually in respect to its suitability for an intended purpose. These characteristics are controlled or influenced by substances, which are either dissolved or suspended in water. Although scientific measurements are used to define the quality of water, it's not a simple thing to say that " this water is good ," or " this water is bad ". The quality of water that is required to wash a car is not the same quality that is required for drinking water. Therefore, when we speak of water quality, we usually want to know if the water is good enough for its intended use, be it for domestic, farming, mining or industrial purposes, or its suitability to maintain a healthy ecosystem. What is meant by water quality management? Water quality is changed and affected by both natural processes and human activities. Generally natural water quality varies from place to place, depending on seasonal changes, climatic changes and with the types of soils, rocks and surfaces through which it moves. A variety of human activities e.g. agricultural activities, urban and industrial development, mining and recreation, potentially significantly alter the quality of natural waters, and changes the water use potential. The key to sustainable water resources is, therefore to ensure that the quality of water resources are suitable for their intended uses, while at the same allowing them to be used and developed to a certain extent. Effective management is the tool through which this is achieved. Water quality management, therefore involves the maintenance of the fitness for use of water resources on a sustained basis, by achieving a balance between socio-economic development and environmental protection. From a regulatory point of view the "business" of water quality management entails the ongoing process of planning, development, implementation and administration of water quality management policies, the authorisation of water uses that may have, or may potentially have, an impact on water quality, as well as the monitoring and auditing of the aforementioned. Water quality management increasingly requires catchment rehabilitation through a range of rural and urban measures, implying an integrated approach that requires cooperation with other sector regulators. Why do we need to manage water quality? Sustainable development is critically dependent on assurances of water that is fit-for-use and the demand for good water quality will continue to grow as the country’s population increases and further development takes place, hence placing increasing pressure on the country’s already scarce water resources and concurrently, increasing potential threats to water quality. The effects of polluted water on human health, on the aquatic ecosystem (aquatic biota, and in-stream and riparian habitats) and on various sectors of the economy, including agriculture, industry and recreation, can be disastrous. 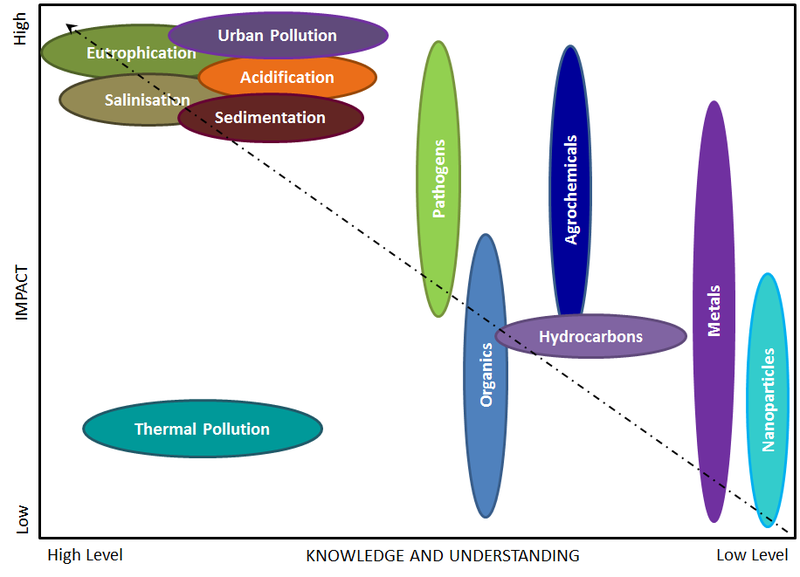 The pollution challenges manifest at various scales, differ between catchments, and have different severities of impact. Increasing demands for limited water supplies, climate change effects, the development of new chemicals that enter water resources, new technologies and innovation for treating water, and the need for increased public awareness all add to the complexity of managing water quality. What are the main water quality parameters of concern in South Africa? The pollution challenges in South Africa have different scales and severity of impact, and some are more geographically specific than others. 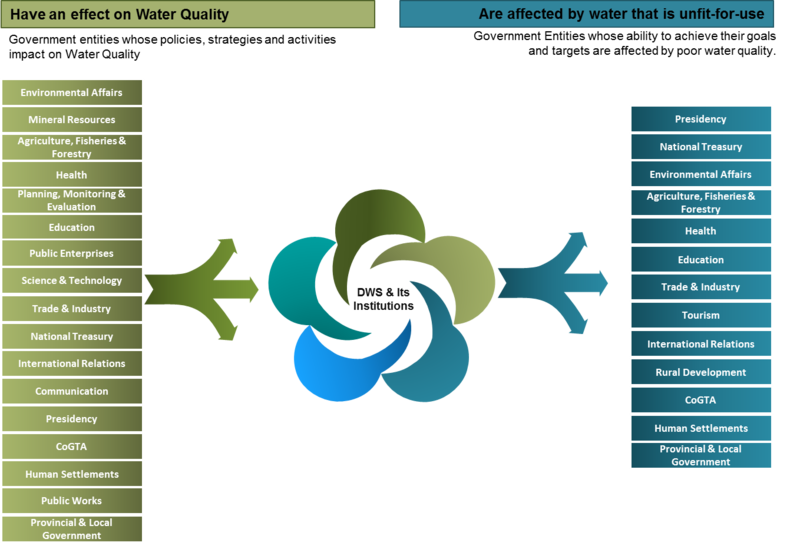 The prevalence and/or severity of impact of particular water quality issues can vary markedly from river system to river system and between Water Management Areas (WMA). Based on an analysis of the scale and severity of impact, five water quality issues stand out as priority issues of national importance. There are some pollutants, such as industrial and agrochemicals, metals and nanoparticles about which there is insufficient information to understand the severity of impacts, which may be significant, and about which more research and investigation is needed to inform the actions to be taken. Good research and accessing of knowledge from the international water sector must inform the approach to managing potential new pollutants. Critically however, precaution must be applied in relation to pollutants around which little is known, to avoid the introduction of potentially harmful new pollutants into our water resources. What are the future trends that may affect South Africa's Water Quality? These may result in new or accelerated water quality impacts and need to be integrated into the management approaches. These trends are complex and inter-connected and create challenges in balancing of socio-economic development needs, on-going uncertainties in governance, challenges with appropriate technical capacity and impacts of global shocks like climate change and disasters. Who is responsible for Water Quality Management? However, while the Department of Water and Sanitation is the department primarily responsible for protecting water quality in South Africa, there are a number of other government departments and spheres of government that also have important roles in this regard, in particular, national and provincial departments of Mineral Resources, Agriculture, Environmental Affairs, Health, Trade and Industry, Education (Basic and Higher), Rural Development and Land Reform, Human settlements, National Treasury, and Municipalities. Water quality management increasingly requires an integrated approach that requires cooperation with other sector regulators. Looking after the quality of our water resources is also seen as the responsibility of all levels of the community, including, private businesses as well as individual water users. Through our collective efforts, the vision of access to clean water and dignified sanitation and effective and efficient water resources management, to ensure sustainable economic and social development, may be realised. Numerous platforms are available to ensure that efforts are collaborated and inclusive. For water quality the most effective "vehicle" for facilitating participatory management, is the Catchment Forum. Through such forums, the public can also be involved in water quality management. 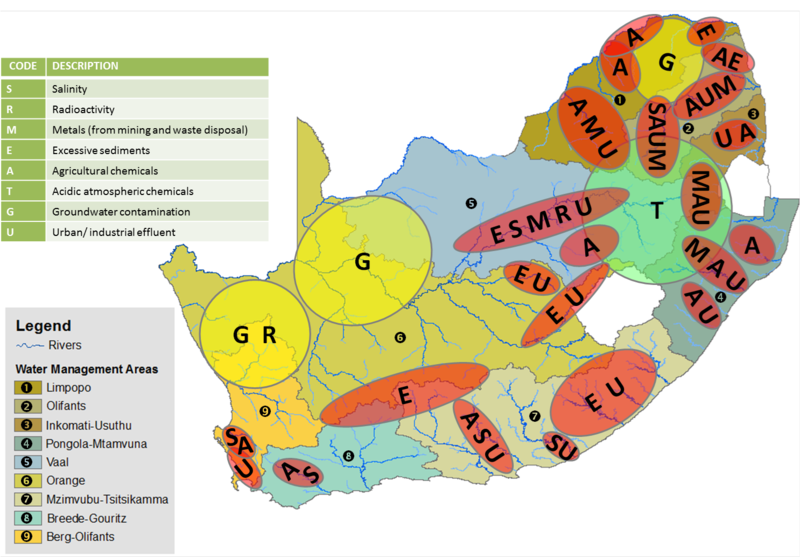 What is the History of Water Quality Management in South Africa? In South Africa, water quality management dates back all the way to the 1900s, when effluent water had to be disposed of onto land instead of being returned to the resource: Under the Public Health Act of the Union of South Africa, 1919 (Act No. 36 of 1919) all sewage and sewage effluents had to be disposed of on land, by means of irrigation or through evaporation in evaporation ponds. The emphasis on the management of effluent quality did not achieve the desired results. Water quality continued to deteriorate, mainly due to other forms of water contamination, not directly covered by effluent quality control, becoming more pronounced. These primarily relate to diffuse sources of contamination and associated land use activities. This necessitated focussing on the water resource to ensure suitable water quality for beneficial water use. This resulted in the Receiving Water Quality Objectives approach, complemented with a pollution prevention approach. The development of catchment management plans, although not entrenched in law, also started within this period to facilitate the implementation of the RWQO’s approach. 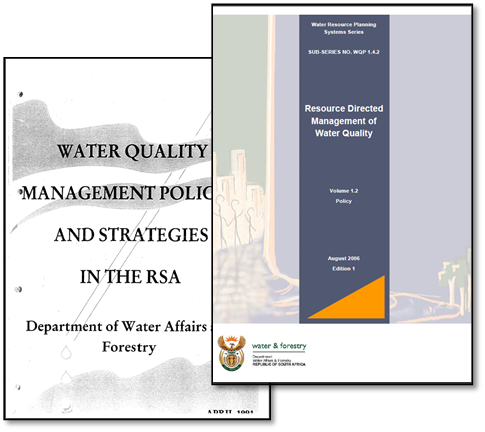 The South African Water Quality Guidelines, which constitute the primary reference when determining the water quality requirements of water users, were also produced during this period, as part of the RWQO approach. With the signing into law of the current Act, the NWA 36:1998, in August 1998, the RWQO approach was broadened, introducing the concepts of Resource Quality and Resource Quality Objectives (RQOs). Resource Quality means the quality of all the aspects of the water resource, which includes water quality, water quantity, as well as the aquatic ecosystem quality (quality of the aquatic biota and in-stream and riparian habitat). RQOs are regarded as a Resource Directed Measure (RDM), which are aimed at providing for the requirements of the water resource. Inherent to this approach, are SDCs that must be established to ensure that the requirements that were set during the RDM process, are not violated. The RQOs approach embodies an approach that strives towards a sustainable balance between protection, on the one side, and water use and development, on the other side. To support the implementation of the new framework, a policy describing the resource directed management approach to water quality that should be followed was published in 2006. 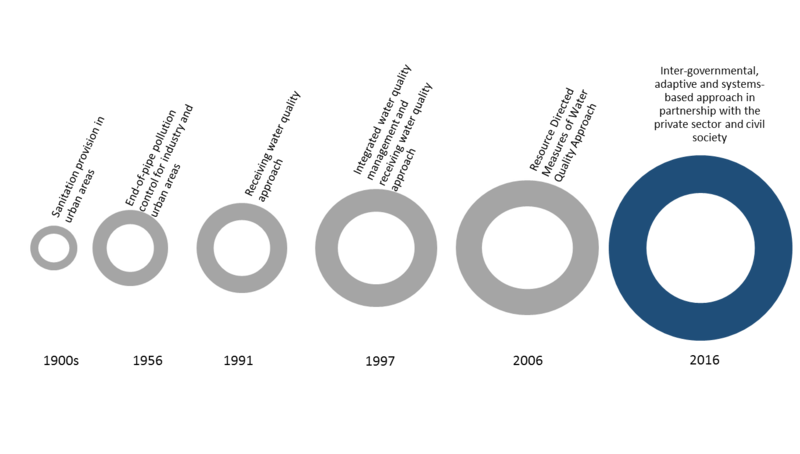 In 2015, it was realized that despite the fact that our management instruments were well conceived from a technical perspective, a far more interactive and integrated approach that requires a new sense of partnership and engagement across sectors, and is aligned with new global trends for WQM was needed. This resulted in the development of a Sector-Wide IWQM policy, which will be put on the table for consideration as the new policy on WQM in South Africa. Why is it necessary to review the current policies on WQM? South Africa currently has two relevant policies for WQM: The 1991 WQM policy and strategy for the RSA and the 2006 Policy on the Resource Directed Management of Water Quality. Although innovative at the time of development these policies are outdated and need to be reviewed so that they are aligned to current legislation, national contexts and global trends in water resource and water quality management and so that they enable the water sector to respond to new and emerging water quality and water quality management challenges. Is it not an implementation issue rather than a policy issue? Whilst there are a number of issues in the water sector that do relate to challenges in implementation, there remain a number of challenges and gaps which need to be address directly by policy and therefore, require amendment to the current policy. How will WQM now be managed differently. Who does the Strategy apply to and how does it apply? The Integrated Water Quality Management Strategy applies to all sectors that impact on or are impacted by water quality. It is a National Policy and Strategy that talks to taking an integrated, adaptive, inclusive and aligned approach to WQM.